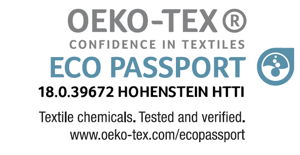 The new HFNSF Industrial Textile Coating (Hybrid Fluorinated Nano Silica Fusion Technology) has passed the rigorous Eco Passport Certification process and so meets the "100 Standard" of the world famous Hohenstein Textile Testing Institute. As a result of this certification end users can now use the OEKO-TEX® label on fabrics coated with this technology. CCM is proud to introduce this truly revolutionary technology to our partners throughout the world.